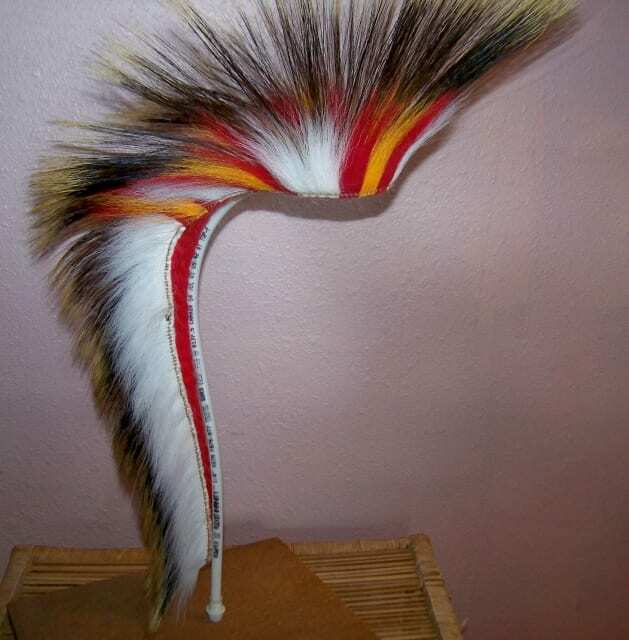 These are are some of the porcupine hair roach head dresses I have made in the past. It has taken me over 30 years to make them of this quality. Prices vary on my roaches. You get what you pay for. A roach that goes for $800 is obviously better than one made for $300. They are both made with the same care. Usually longer hair makes them worth more. It is hard to get long hair, thus the higher price. 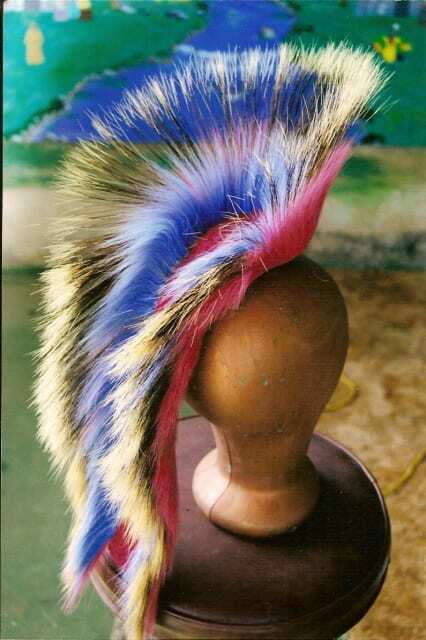 Click on an image for an enlarged view and to ask questions or comment on any of the head dresses that interest you. 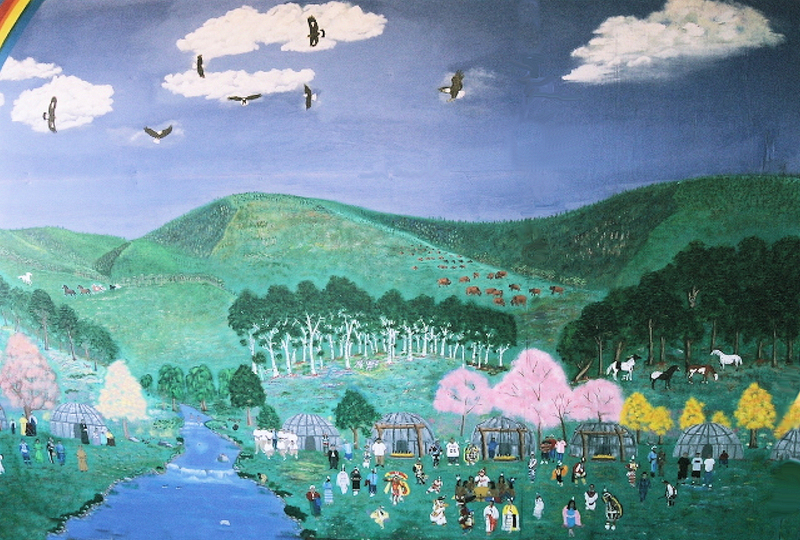 Click on the image again to see a larger view. royal blue roach with white trim on the inside. about 22″ with 8 or 9 inch guard hair. not looking for any fancy colours. Hi Eddie,Hope you liked the hair I sent you. I am starting a new project and already have about 6 to 8 oz of hair. I plan to wait a while to send you more but if you need it let me know. I plan on sending you all my hair from now on. Your pics of roaches you make are outstanding.. What Art. 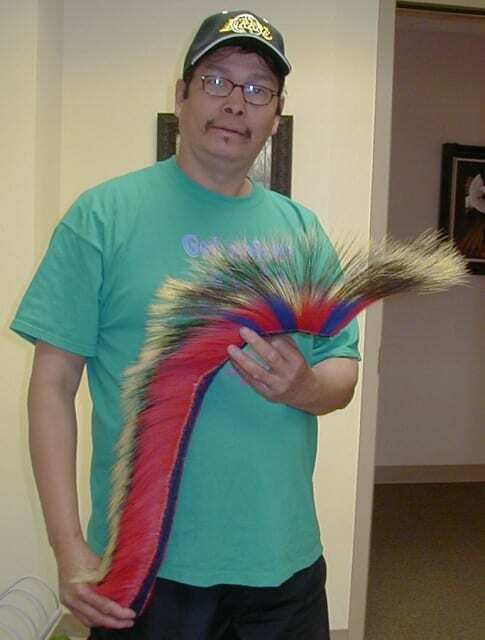 Hi Eddie Joe, my name is JR Abrego and I am a traditional dancer from the Lummi Nation. I saw your pics because I am looking for a new roach. I like the picture (22″ roach. red trim on outside, blue trim on inside). Please send your e-mail address and so I can get the details on purchasing a similiar roach. Hello, I live right down the road in Lawrence, KS. I dance grass and I’m in need of a new roach, just plain white, but very thick, I’d prefer it to be 9-10″ in the front and between 22-24″ long. What would you charge for one like that. I hope to hear from you soon. Hi eddie i’m a grass dancer in search of a roach and your roaches are nice. my colors are white, yellow, red, blue and black but not too muck blue and black.please give a dancer a good estimated price. I am a grass dancer and I need a new roach. I was liking Bill’s Roach or the one you made for kermit. How much would a 15 – 17 inch roach cost? Give a good estimate on price and how long it would take to get. My son is looking for a porky roach. His colors are black, royal blue, purple, and yellow. 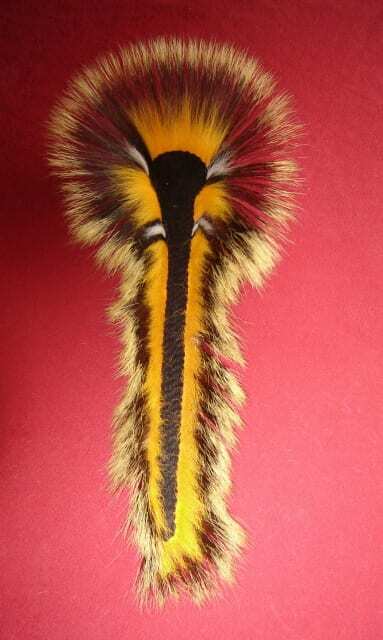 He is hoping to have a roach made that will have the purple, yellow, and blue colors on each quill or running throughout the entire outside of the roach. We don’t know if that is a possibility and would appreciate your advice and suggestions. Could you give me a quote on one that is 18″ long? We would like to have it created by November/December 2009. Thank you for your time in dealing with this matter. P.S. Your roaches are beautiful-I wish you had pictures of more! i sent you an email and it came back. i can make the roach you requested for $400. i guarantee my work. if you arent satisfied, return it in original condition i will give full refund. Hello, Great work – I’m interested in getting a quote on a 20″, one color roach from you. Can you please contact me by email to discuss? Thanks! 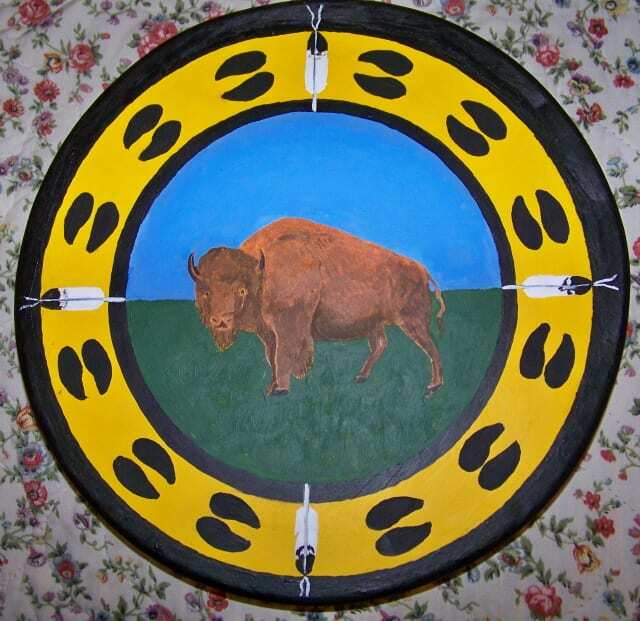 My name is Michael Black Wolf, I am from Fort Belknap, MT. I am looking for a 18-20 inch roach with 9-10 inch guard hair in just plain white(no fancy colors or designs). I would really appreciate a quote from you. You do very nice work-keep it up! 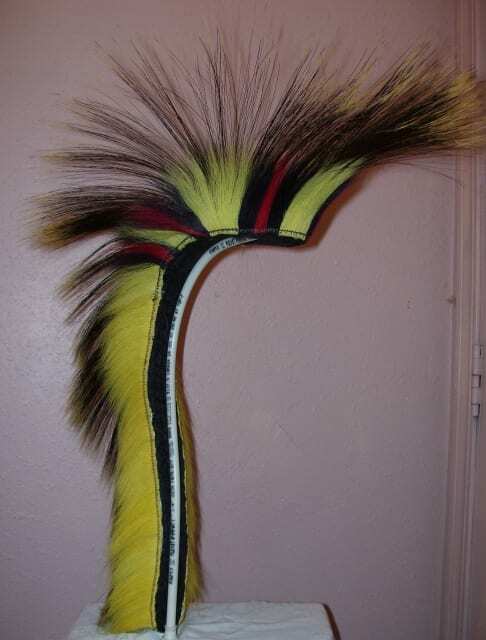 hello michael i like your work very good stuff i am a grass dancer looking for a head dess about 21 to 22inch in length and 9 to 10inch for the guard would like it to be white im looking for a good one so what would you charge. peter, i can do one like that for $750. IM MARTIN AN IM A CHICKEN DANCER AN I WAS LOOKIN AT UR ROACHES AN I MUST SAY U DO SOME MITEY FINE WORK BUT I WAS LOOKIN FOR A WHITE AN LITE BLUE WITH A FADE OF DARK BLUE IN IT BUT THE GUARD HAIRS TO BE REAL THICK AN FOR THEM TO BE AT LEAST 9 INCHES IF U CAN THANK U SO I HOPE TO HEAR FROM U REALL QUICK OH AN THAT EMAIL IS MY MYSPACE…! Do you do roach repair? 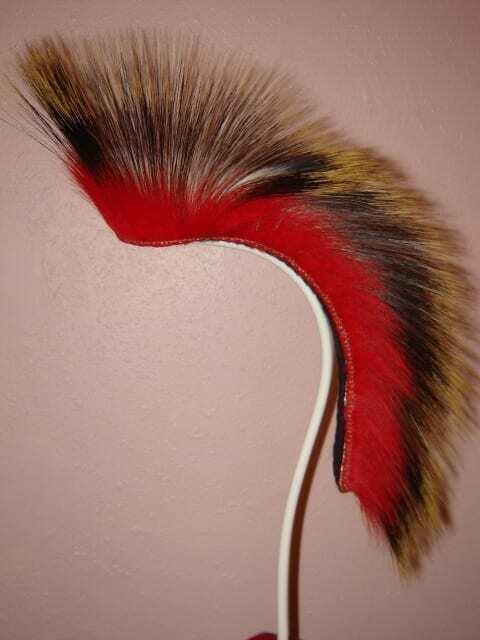 I have a 22″ red, yellow, and black roach with 8-9″ hair in front. The hair in front is very thin. Could you repair something like that? how much would it cost for a 19inch red porcupine roach cost? i can do one for 500. if you arent satisfied, send back and i will give full refund. sorry i couldnt get a reply back. i can do one for 800. guarantee it or money back. im looking for a 22” ER!!!!! with 13 inch or higher porccupine hairs!! 8 to nine inch hair guards!!! hit me back to my email bro to inquire on further details!! im twelve years old and i need a roach.the colors are black and purple about a 19inch and how much will that cost. Can you give me an estimate on a boy roach, interested in the K.c chief roach but different colour. debbie it all depends on length of the roach and the length of the front hair. i’d say anywhere from 3-5 hundred. 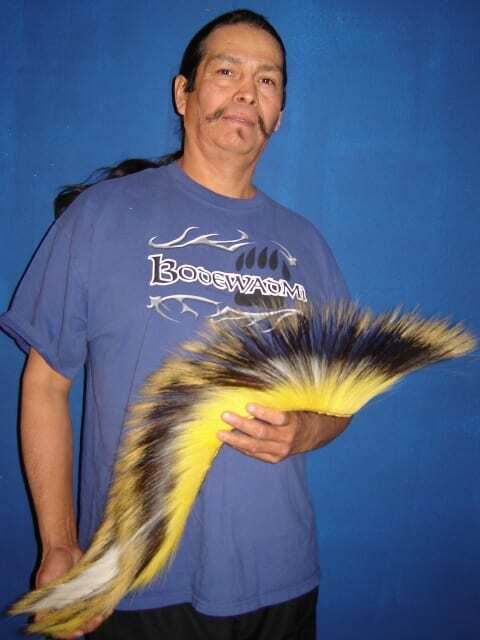 HI, can you give me a quote on a 22″ roach with 9″ guard hair. 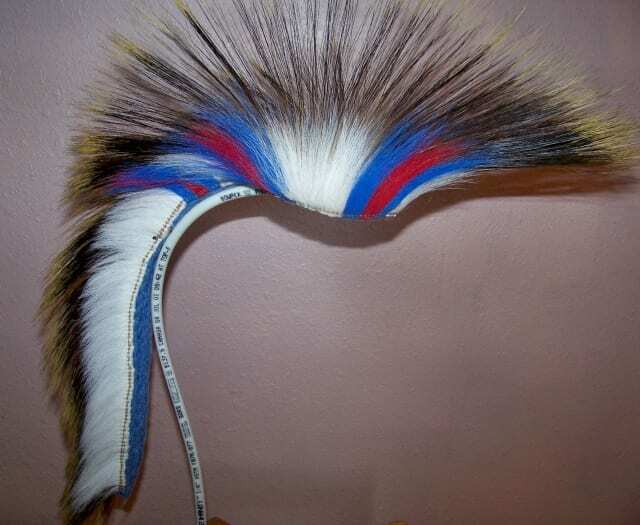 Would be interested in having 2 or 3 colours in the deer hair. Also what is the turn around time on that? hi. I am looking for a new roach, but don’t have a ton of cash right now. I am a northern traditional dancer, and am starting to work on my chicken outfit. I’d like to find a roach that goes with my colors, black and purple. I’d like it to be 20-22 inches long and about 9 inches tall. Also, would you be able to cut down on the price if you used more “economically-minded” supplies, such as horse hair or fiber instead of the porky quills? It doesn’t really bother me if you use cheaper supplies, as i’m not a competition dancer, but rather it is a hobby and love of mine. Thanks. I am a grass dancer and I have grown out of my current roach. I am looking for about a 17 inch roach. I was liking the looks of the one you made for kermit or the one your holding with the yellow base and black trim. How long would it take to make and how much would it cost? Also could you ship to the panhandle of Texas? alex, could do a 17 inch one for $400. i can do a roach in 3 days. thing is the time. just got thru 5 days of ceremonies and have been getting ready for an art show. will be done with show saturday. i can ship anywhere in u.s.
Hi, my name’s nick and i REALLY need a new roach. I was wondering if you could cut me a deal on getting one. I’d like it to be about 20″ long, and about 8-9″ tall in front, and all black or perhaps red and black (black is the base color). How much would you charge for something like that? have to check if i got that much hair for the front. if i do i will charge you $700. daniel dont have much hair that is 9-10 inches long. 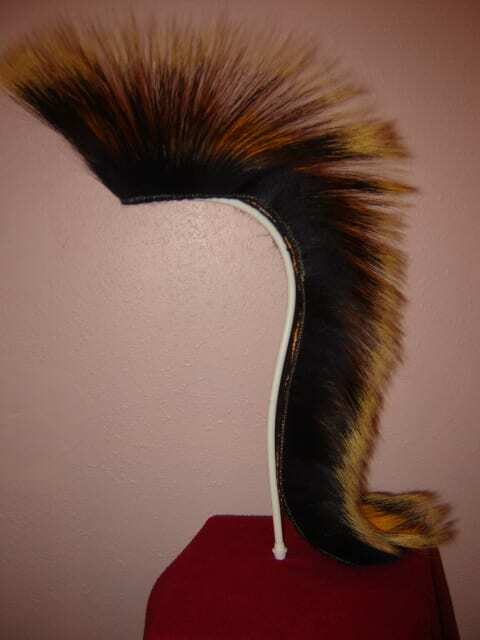 nokuse i can do an 18″ roach with 8″ front hair for $650. Thats with the inside trim only around the crown. 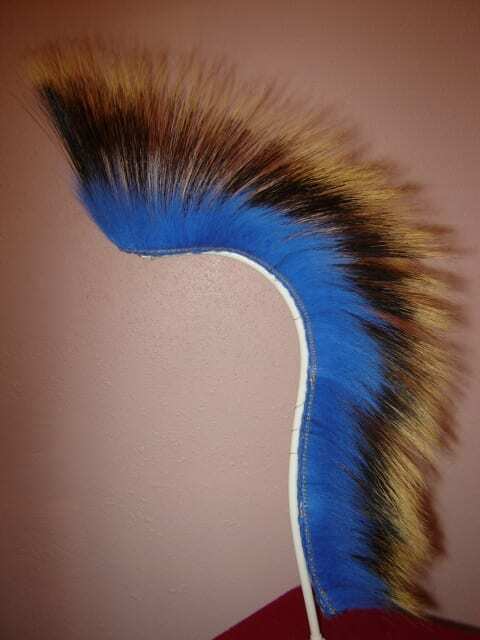 i dont do full trim on the inside since you dont really it in the tail part anyway. the outside trim will be all around though. sold that roach, so i cant post a picture of it on someone. prices vary depending on length of front hair. a 22 inch one will typically go for around 5 or 6 hundred. 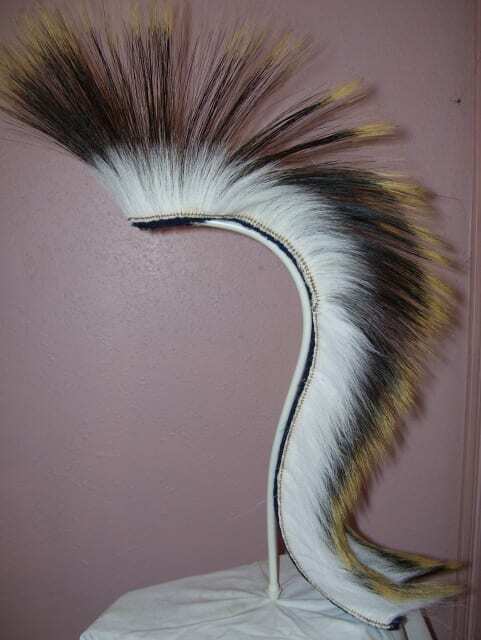 ..hello..my name is chris i am a grass dancer and am in need of a 22’long dance roach..white deer hair nothin fancy.91/2-10′ ‘guard hair..but if there is extra cost for colors let me know..i have a 500$ to spend..so if you could possibly help me out .my last roach was stolen and it wasnt even a yr old .so now i am on the hunt for a new one…e-mail me andlet me know how many rows there are..i kinda want it to look thik u know so i can have it sway wen i jam it out..i hope to hear from you and thank you..
i understand your prices and value your work. i’m willing to pay your prices. please email me. i really want one of your roaches. Hey Eddie, names Michel I play drums for Buffy Sainte-Marie and looking for some regalia for our 2013 World Tour, here’s a little run down of our concert. We play for 90minutes and then our encore consist with me grass dancing our way off the stage. My question is (I need a roach) and can you make one or have any in stock? 🙂 and.. what do you need from me? I really hope you can get back to us. michel i have one in stock that is yellow, red and black. can send a picture if you are interested in it. i work full time so i dont know when i can get to making one. hello there, my son is a fancy dancer and I have a question? do you repair roaches, it was my old roach and I have passed it down to him, so we were wondering if it can be repaired and add a yellow color to the base, currently it use to be white? I don’t usually repair roaches. I don’t know how the maker attached everything. I don’t want to mess up a roach that has meaning to someone. I am interested in buying 1 plain for elevon yearold. Two adult ones. Can you get back to me on this please. Hello, you make beautiful roaches. I started grass dancing last year and in need of a headdress are you in the Vancouver area?